What Is DA Form 285-B? 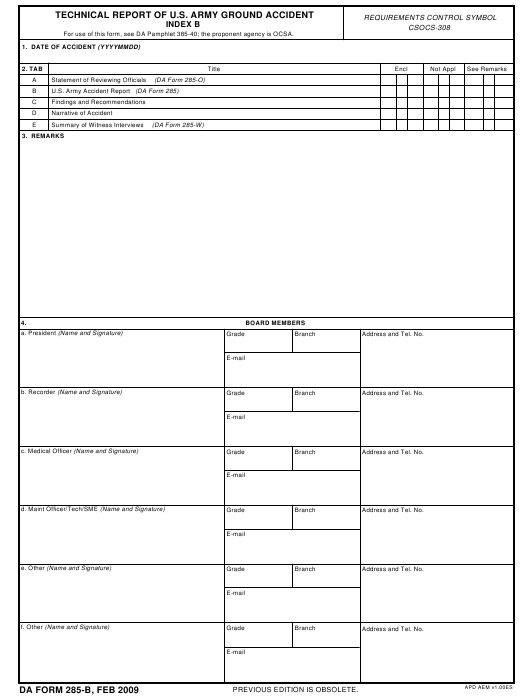 DA Form 285-B, Technical Report of U.S. Army Ground Accident Index B is a form used for making reports of Class B ground accidents in the U.S. Army. The completed report must be submitted to the U.S. Army Combat Readiness Center (USACRC) within 90 days from the date the accident occurred. The Department of the Army (DA) released the latest version of the form - sometimes confused with the DD Form 285, Appointment of Military Postal Clerk, Unit Mail Clerk or Mail Orderly - in February 2009. An up-to-date DA Form 285-B fillable version is available for digital filing and download below. Three or more individuals were hospitalized as in-patients as the result of a single event. How To Fill Out Da Form 285-b? The DA form 285-B is a necessary part of an accident folder of a Class B accident. Accident folders used for each Class A and Class B accident to enclose the forms and the substantiating data submitted with the main reports. The date of the accident should be provided in Block 1. Block 2 is a table used for listing the supporting documents related to the accident and attached to the report. An X should be placed in the appropriate column to reflect whether the data in "enclosed", "not applicable" or the "requires remarks". Block 3 is for the remarks. These must include the information on any of the unavailable supporting documents listed in Block 2, whether delayed or unavailable. An estimated forwarding date is required for delayed data,. If the information is unavailable, the remarks must list the reasons for non-availability. Block 4 requires the names, signatures, grades, branches of service, unit addresses, e-mail addresses, and telephone numbers of all members of the Accident Review Board. DA Form 285, Technical Report of U.S. Army Ground Accident is a form used for reporting any ground accidents of any class.